For the heart to work effectively, the atria and the ventricles must be activated rapidly and sequentially. Rapid activation is important in order to activate as much myocardium simultaneously as possible; the more myocardium contracting at the same time the more efficient the pumping mechanism. Sequential activation implies that the atria are activated first and they fill the ventricles with adequate volumes of blood, before ventricular contraction commences. To coordinate these two tasks, the heart has an electrical conduction system composed of specialized myocardial cells (henceforth referred to as conduction cells). These cells forms bundles of fibers which act as electrical cords that spread the action potential rapidly and sequentially to contractile myocardium in the atria and the ventricles. When contractile myocardium receives the action potential, it is activated and contracts. Figure 1 illustrates relevant components of the conduction system, the heart and the classical ECG waveforms. Figure 1. The cardiac cycle starts when cells in the sinoatrial node discharges an action potential that spreads as an electrical impulse through the atria and – via the atrioventricular node – to the ventricles. As the impulse spreads through the myocardium, it activates the cells which respond by contracting. The action potential generates electrical currents which gives rise to the classical ECG waveforms presented here. Activation of the atria is reflected as the P-wave and activation of the ventricles results in the QRS complex. The T-wave reflects the recovery (repolarization) of the ventricles. Note that the ECG rarely shows atrial recovery (repolarization) since it coincides with ventricular depolarization (i.e QRS complex), which has much stronger electrical potentials. Conduction cells form the fiber networks that sprout into the myocardium and disseminate the action potential. These cells have virtually no contractile function. Contractile myocardial cells carry out the actual contraction but are also capable of transmitting the action potential, albeit at a much lower speed than the conduction cells. The terms contractile myocardium, myocardium or simply myocardial cell, refer to this cell type and these terms are used interchangeably. In contrast to skeletal muscle, cardiac cells display a branch-like morphology. As illustrated in Figure 2 all cardiac cells are connected, both electrically and mechanically, along their long axis. This cell architecture is referred to as a syncytium, which implies that the entire network of cells functions as one unit. It follows that if one cell in the syncytium is activated, it will activate all cells downstream (provided that they are excitable). The connections between the cells are termed intercalated discs. The intercalated disc is composed of cell membrane proteins that connects adjacent cells both mechanically and electrically. The electrical connection is established by gap junctions, which are proteins that forms channels between the cell membranes. Electrically charged ions can flow between cells through the gap junctions. It follows that the action potential can spread from one cell to the next using this route. Figure 2. Schematic illustration of the myocardial syncytium. Note the branched cell structure and the connections between the cells. The action potential includes a depolarization (activation) followed by a repolarization (recovery). As mentioned above, the cardiac cycle starts when the sinoatrial node discharges the first action potential, which then spreads through the myocardium like a wave front in water. Specific ion channels located on the cell membranes open and close during de- and repolarization, such that ions (Na+ [sodium], K+ [potassium], Ca2+ [calcium]) can flow between the intra- and extracellular compartment. Thus, the action potential involves movement of ions – which are charged particles – and therefore the action potential generates an electrical current. Figure 3 (below) shows the appearance of the action potential in myocardial cells (the action potential will be discussed in detail in the next article). Note that the terms electrical impulse, impulse and impulse wave are used interchangeably to refer to the wave-like spread of the action potential in the myocardium. Figure 3. The action potential of contractile cells. Inactive (resting) myocardial cells have a resting membrane potential of -90 mV. Upon stimulation, the cell depolarizes and a rapid increase in the membrane potential is noted. The cell returns to its resting state by repolarizing. These concepts are discussed in detail in the next article. Depolarization activates the myocardial cells and induces cellular processes that lead to cell contraction. The spread of an electrical impulse is therefore directly coupled to a mechanical event (this is referred to as electromechanical coupling). Because there is an abundance of ions in the tissues and fluids surrounding the heart – and indeed in the entire human body – the electrical currents generated in the heart are transmitted all the way to the skin, where they can be recorded using electrodes. Electrocardiography is the art of recording and interpreting the electrical potentials generated in the myocardium. The electrocardiograph presents these electrical events in a diagram referred to as electrocardiogram (ECG). The electrical potentials generated by components of the conduction system (sinoatrial node, atrioventricular node, bundle of His, Purkinje fibers) are too small to be detected using surface (skin) electrodes. Hence, the ECG only presents activity of contractile atrial and ventricular myocardium. This is unfortunate because the conduction system plays a pivotal role in cardiac function and certainly ECG interpretation. Luckily, it is almost always possible to draw conclusions about the conduction system based on the visible ECG waveforms and rhythm. 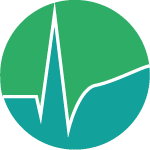 In some instances, however, invasive electrophysiological studies (recording of electrical activity from inside the heart using catheters equipped with electrodes) is necessary. The sinoatrial node is a small oval structure located near the entrance of the superior vena cava in the right atrium (Figure 1). The sinoatrial node consists of highly specialized cells with a distinct ability to depolarize spontaneously, without being stimulated. Thus, the cells of the sinoatrial node are capable of spontaneously discharging an action potential. This ability to depolarize spontaneously is referred to as automaticity. The cells of the sinoatrial node have an intrinsic rate (frequency) of depolarization at approximately 70 times per minute (which results in 70 heart beats per minute). The sinoatrial node is often referred to as the primary pacemaker of the heart. The rate of spontaneous depolarization in the sinoatrial node is modified by the autonomic nervous system. Sympathetic stimulation increases the rate whereas parasympathetic stimulation lowers the rate. Hence, heart rate increases as sympathetic tone is increased and heart rate decreases as parasympathetic tone increases. The heart rate at any given instant depends on the balance between sympathetic and parasympathetic activity. Sympathetic activity dominates during physical exercise, whereas parasympathetic activity dominates during rest. Parts of the atrial myocardium: There are clusters of atrial myocardial cells located around the crista terminalis, the entrance of the coronary sinus and the inferior vena cava, as well as cells around the mitral and tricuspid valves, which possess automaticity. These cells are not conduction cells per se; they are actually contractile cells which possess automaticity. Thus, automaticity is not exclusive to cells of the conduction system. Myocardium surrounding the atrioventricular (AV) node: It is a common misconception that the atrioventricular (AV) node possess automaticity, because there is no compelling evidence for that. There is, however, evidence that cell clusters surrounding the AV node possess automaticity. This automaticity will still – despite what has just been stated – be referred to as automaticity of the AV node in order to facilitate understanding. The His-Purkinje network: The bundle of His and the entire Purkinje network possess automaticity. The observant reader may have noticed that the ventricular myocardium does not possess automaticity, and this is important to note as we shall see in later chapters. Thus, the heart has four pacemakers (the sinoatrial node; parts of atrial myocardium; myocardium around the AV node; the His-Purkinje network). The reason that the sinoatrial node is the primary pacemaker is simply because it has the highest intrinsic rate of spontaneous depolarization (i.e the fastest automaticity). Heart rhythm is directed by the fastest pacemaker (i.e the structure with the highest rate of spontaneous depolarization) because that pacemaker will depolarize before the competing pacemakers and reset them before they discharge an action potential. The sinoatrial node may become dysfunctional and fail to depolarize. Failure to depolarize may be intermittent, or persistent for longer periods or even permanent. 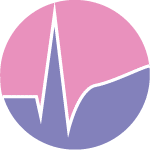 This could potentially result in cardiac arrest but it rarely does, because absence of sinoatrial impulses will allow for one of the other pacemakers to establish a heart rhythm. This behavior is the reason why the other pacemakers are often referred to as latent pacemakers. The intrinsic rate of spontaneous depolarization in the latent pacemakers is highest in the atrial myocardium and lowest in the Purkinje fibers. Thus, automaticity appears to decline gradually with the distance from the sinoatrial node. This means that if the sinoatrial node fails to depolarize, it is most likely that a salvaging rhythm will be established by atrial myocardium. Should the atrial myocardium also fail, then it is most likely that the cells around the atrioventricular node will take over the rhythm. As a last resort there is an extensive network of Purkinje fibers, starting in the bundle of His, which can establish a rhythm. This succession, from the sinoatrial node to the Purkinje fibers, is referred to as pacemaker hierarchy. Figure 4 displays the pacemaker hierarchy. It should be noted that the automaticity discussed above is normal automaticity, which only occurs in the sinoatrial node and the latent pacemakers. However, there is also abnormal automaticity, which can arise anywhere in the heart, including in ventricular myocardium. This is discussed later. Figure 4. Overview of the electrical impulse during a cardiac cycle (left hand side) and the pacemaker hierarchy (right hand side). All pacemaker structures are capable of spontaneous depolarization (automaticity), and can therefore serve as the heart’s pacemaker. The rate of spontaneous depolarization is highest in the sinoatrial node, which is why it is the primary pacemaker. The cells of the conduction system have virtually no contractile function. Conduction cells are merely responsible for spreading the depolarization rapidly and synchronously to the contractile cells, so that they can contract in concert. However, there are fewer conduction cells than contractile cells, which implies that conduction cells only communicate with a portion of the contractile myocardium. The remaining contractile cells, which do not communicate directly with conduction cells, depend on other contractile cells to obtain the electrical impulse. Recall that all cells in the heart are connected, both mechanically and electrically and this enables the electrical impulse to spread from one cell to the next. However, impulse transmission between contractile myocardial cells is considerably slower than transmission through the conduction fibers. 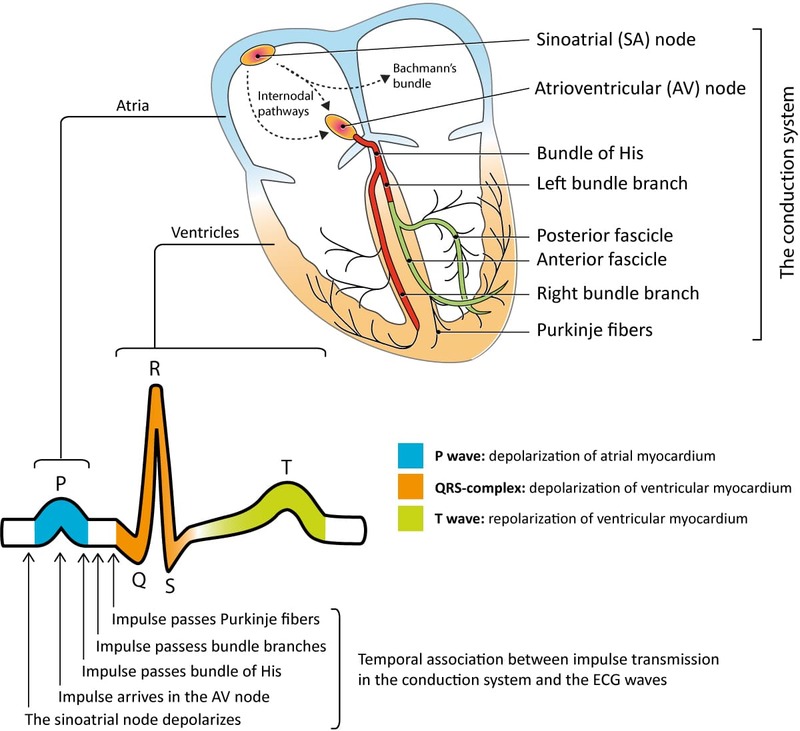 The conduction system is vaguely defined in the atria, as compared with the ventricles which boasts with distinct conduction structures such as the bundle of His and the bundle branches. There are, however, three rather distinct fiber bundles which appear to serve as the conduction system of the atria. These bundles transmit the atrial impulse at a speed of 1 m/s and they are referred to as the internodal pathways. One of these is Bachmann’s bundle, which conducts the impulse from the right to the left atrium. Refer to Figure 1 (above). The atrioventricular (AV) node is the bridge between the atria and the ventricles. It is located in the atrial septum and normally the only connection between the atria and ventricles (Figure 1). The AV node receives the atrial impulse and delays it before conducting it to the ventricles. The delay is due to the slow conduction through the atrioventricular node. The purpose of the slow conduction is to give the atria adequate time to fill the ventricles with blood, before ventricular contraction commences. The atrioventricular node continues in the bundle of His which splits up in the left bundle branch and the right bundle branch. These bundles successively branch into finer bundles and ultimately Purkinje fibers which sprout into the myocardium. Note that the left bundle branch splits into an anterior and a posterior fascicle. Impulse transmission in the Purkinje network is very fast (4 m/s). The Purkinje fibers run mainly through the endocardium where they deliver the depolarizing impulse to contractile myocardial cells. Some Purkinje fibers extend deeper into the myocardium (rarely deeper than a third of the wall’s thickness). 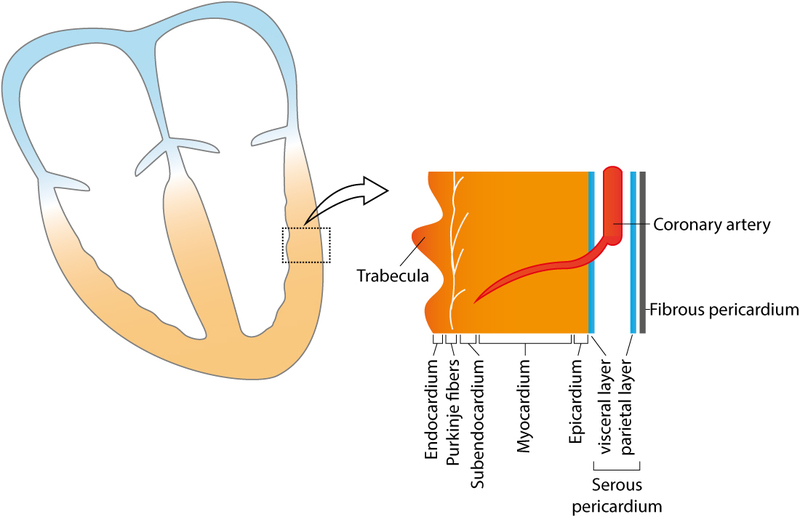 This means that activation of the ventricles (except from the septum) starts in the endocardium and spreads towards the epicardium (Figure 5). The rapid impulse transmission in the Purkinje network allows virtually all ventricular myocardium to be activated simultaneously. As noted above, when the impulse is delivered to the contractile myocardial cells, the subsequent impulse transmission takes place from one contractile cell to the next, which is much slower (0.4 m/s). Figure 5. Schematic figure of the ventricular wall. Note that the term myocardium is often used to refer to all layers. The vagus nerve provides the heart with parasympathetic fibers. These fibers primarily innervate the sinoatrial node and the atrioventricular node. Increased vagal tone leads to slowed automaticity in the sinoatrial node and slowed conduction through the atrioventricular node. This leads to lower heart rate (and a negligble increase in the delay in the atrioventricular node). Intensive vagal activity may actually inhibit sinoatrial activity to the extent that no impulses are generated and this may lead to syncope (fainting). As discussed above, latent pacemakers will awake and take over generation of action potentials until the sinoatrial node recovers. Sympathetic fibers innervate the entire heart, both the conduction system and contractile myocardium. The fibers run along the blood vessels and are particularly dense in ventricular myocardium. Sympathetic stimulation leads to increased excitability in all cells. This means that increased sympathetic activity results in increased heart rate (by increasing automaticity in the sinoatrial node), increased contractile force and increased speed of impulse conduction. A rhythm is defined as three consecutive heart beats displaying (more or less) identical waveforms on the ECG. The similarity of the waveforms indicates that their origin is the same. The sinoatrial node is the heart’s pacemaker under normal circumstances and the rhythm is referred to as sinus rhythm. Although it is not possible to discern the electrical potentials of the sinoatrial node itself, there are indirect evidence from the ECG that confirm the origin of the rhythm (discussed later). Should any structure outside of the sinoatrial node discharge an action potential that results in myocardial depolarization, that structure is referred to as ectopic focus and the beat is called an ectopic beat. An ectopic rhythm occurs when three or more consecutive heart beats originate from an ectopic focus. If an ectopic rhythm is a replacement for the normal sinus rhythm, it is referred to as escape rhythm. These topics will be discussed in detail later on. The cardiac cycle begins when the sinoatrial node discharges an action potential that spreads through the heart. The action potential spreads in the form of an electrical impulse, by cell-to-cell transmission of the depolarization. The impulse spreads via the internodal pathways and Bachmann’s bundle in the atria. It is then delayed briefly in the atrioventricular node before it is rapidly disseminated – via the His-Purkinje network – through the ventricular myocardium. The contraction starts when contractile cells receive the impulse. 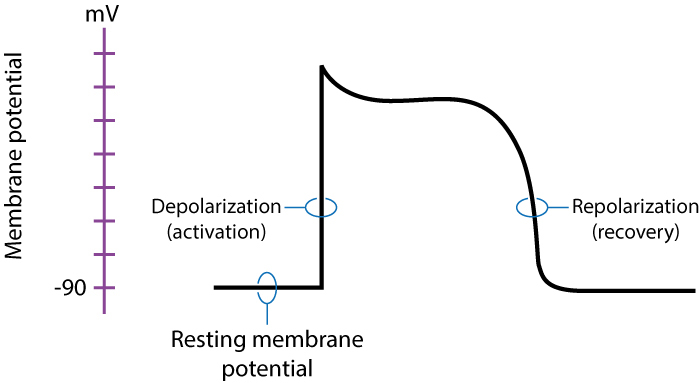 The action potential consists of a depolarization (activation) and a repolarization (recovery). This process includes rapid changes in the membrane potential, which is a consequence of ions flowing across the cell membrane. Flow of ions is equal to an electrical current and the electrical activity of atrial and ventricular myocardium is recorded and analysed by electrodes placed on the skin. ECG interpretation is all about deciphering these electrical currents. Interested readers may study the Wiggers diagram below. It displays the association between the ECG, pressure and volume in the heart during the cardiac cycle. Figure 6. 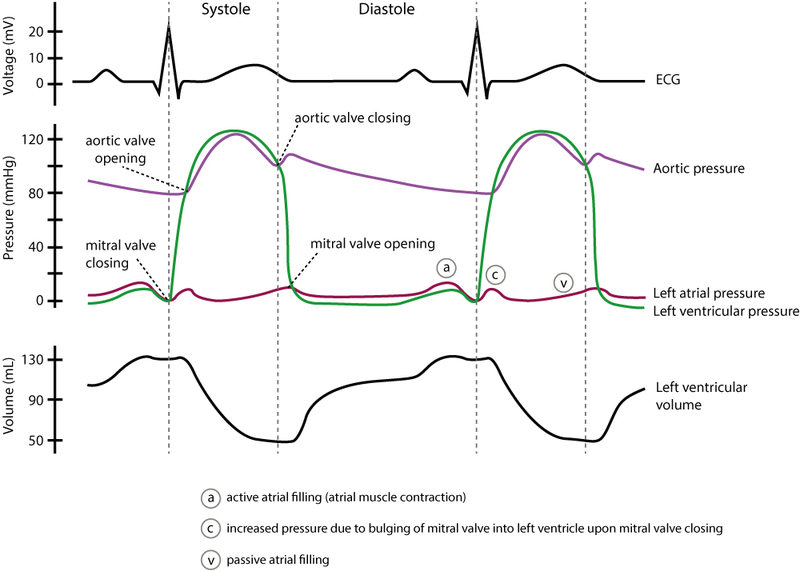 A Wiggers diagram is a standard diagram used in cardiac physiology to illustrate the association between aortic pressure, ventricular pressure, atrial pressure, volumes and ECG waveforms.